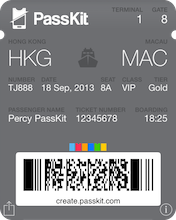 This pass has been created using a third party service, PassKit, that is owned and operated by: PassKit, Inc., Golden Sun Centre, 59-67 Bonham Strand West, Sheung Wan, Hong Kong SAR Tel: +852 5804 9280 https://passkit.com support@passkit.com The Pass Issuer has attested that any trademarks and/or copyrighted content contained within this pass are being used with the consent of the owner. Questions, complaints, or claims with respect to this pass should first be addressed to the Pass Issuer. 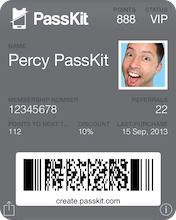 NEITHER APPLE NOR PASSKIT SHALL BE LIABLE FOR ANY DAMAGES OR LOSSES ARISING FROM ANY USE, DISTRIBUTION, MISUSE, RELIANCE ON, INABILITY TO USE, INTERRUPTION, SUSPENSION, OR TERMINATION OF APPLE WALLET, THIS PASS, OR ANY SERVICES PROVIDED IN CONNECTION THEREWITH, INCLUDING BUT NOT LIMITED TO ANY LOSS OR FAILURE TO DISPLAY YOUR PASS IN APPLE WALLET OR ANY CLAIM ARISING FROM ANY USE OF THE FOREGOING BY YOU, THE PASS USER. This page will always show the latest version of your pass. Please bookmark this page or return to this address on an iPhone or iPod touch running Apple iOS6 or later, or any Android device to add this pass to your mobile wallet. To learn more about Pass Certificates and how to upload or get a private certificate for your organization, please click here. These options allow you to configure your pass to integrate into your existing systems and/or apps. Passes that work with Apple Pay can send reward card information to a terminal as part of an Apple Pay transaction. To support this feature, the terminal manufacturers must implement the Value Added Services Protocol. It is available only for Store Card style passes and requires a NFC enabled Pass Type ID certificate. Rewards enrollment lets you create a pass that prompts the user to sign up for a rewards program. The user can provide personal information during signup which is used to update the pass. To display this data on the pass, please use the following Item Names for your pass fields: fullname, givenName, familyName, emailAddress, phoneNumber, ISOCountryCode, postalCode. Here is where you add content to the face of the pass. Each field requires a unique name that will be used by the API when updating the pass. Each pass type has a prescribed layout and a maximum number of fields. Apple Wallet will automatically shrink long text values and very long text values may be cut short. Use the dynamic option if the label or data value will be different on each pass. If you add a change message, an alert will appear on the user's lock-screen or notification centre whenever the pass is updated with new data. Each pass may contain a barcode that can be scanned by the pass issuer to identify a pass or to trigger some sort of action (E.g. update a field on the pass and push an update). Apple Wallet supports 4 types of barcode. Which barcode is most appropriate will depend upon the amount of information you wish to encode, the capability of your scanning technology and the design of your pass. 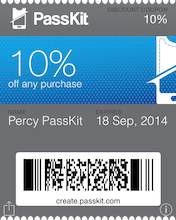 Square barcodes (Aztec and QR Code) work better for large messages but reduce the amount of other information the pass can display for certain pass types. Code 128 Barcodes require a fallback fro devices running iOS 8 or earlier. If you would like to digitally sign your Barcodes for use with Pass Verifier App, please enter your Pass Verifier credentials below. To stop signing passes, delete your credentials. You can include up to 20 fields on the back of the pass. Fields take up the entire width of the pass and each additional field will appear below the previous one. 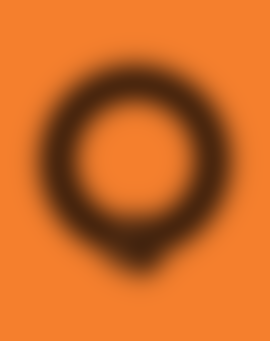 If the field is dynamic and a change message is set, an alert will appear on the user's lock-screen or notification centre whenever a change is pushed to the pass. If you are using your own certificate, you are reminded that Apple requires that your Company name, address and telephone number appears in one of these fields. You can customize the look and feel of the Pass by changing the colors and images below. Only options relevant to the selected pass type will be displayed. Strip Images for Event Tickets should be at least 640px wide. Personalization images should be at least 80px high. 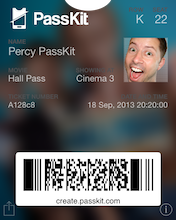 Passes are integrated with the lock screen to make relevant pass immediately accessible. Relevance information is passive: it helps users find passes when they need them by putting relevant passes right on the lock screen. Choose any or all of the following lock screen options. A date can be used to provide context to locations. For example for a flight, you would want the lock screen notification to show only the day of the flight, and only when in proximity of the Airport. If you would like the Pass to display a message on the screen when the user is close to a location where it can be used, you can enter up to 10 locations below. If you would like the Pass to display a message on the screen when the user is close to a Bluetooth Beacon where it can be used, you can enter up to 10 Bluetooth Beacons below. If you would like to localize the pass for multiple languages please select the desired language and provide translation below. If you choose, you can also supply provide separate images for each language. Unless a specific language is specified, the pass will dispaly field labels and data as specified in this template. Dates, numbers and currency data types will always be displayed according to the users's language and region preference. This pass has not been saved. Please save the pass to generate the distribution links.